Ella Cotton Rownd has provided the community of Cedar Falls with an outstanding example of how one individual can have a long term impact on the quality of community life while also caring for her family. Ella’s careful estate planning insured that her family was provided for and that her estate would benefit the community after their deaths. The Ella C. Rownd Trust was established in 1967 and since its inception has served as a catalyst and change agent within the City of Cedar Falls by discovering and responding to significant capital needs and opportunities within the community. Total gifts to the community from the Rownd Trust will exceed $750,000 in 2013. Ella Cotton Rownd was born 9 April 1854 at Rockford, Illinois, the daughter of William and Elizabeth Cotton. William Cotton, a farmer, moved to Cedar Falls before 1880 with his wife and youngest children Frank, Ella, Ida, and Arthur. The Cottons were active in the business and civic life of Cedar Falls. Frank, a farmer, builder, and businessman served as a councilman and as assistant fire chief. In 1909, Frank Cotton built the Cotton Theater on Main Street, a local landmark that still stands. Arthur worked as a farmer and contractor. Ida Cotton married Edwin Overman, son of Cedar Falls’ first mayor, John Milton Overman, and was the mother of one daughter. When Ida died of tuberculosis in 1902 her daughter Edith Overman went to live with Ida’s sister Ella. 1876 in Black Hawk Co., Iowa. The Rownds were early settlers who had established their home in Cedar Falls before 1860. Charles A. Rownd farmed near Cedar Falls, Black Hawk County, Iowa. He was active in the community, serving as a Black Hawk County Supervisor, on the Board of Directors of Wagner Manufacturing, as well as other local boards. In August 1919 when the Cedar Falls National Bank celebrated its 31st anniversary, Charles A. Rownd was the only member of the Board who had served continuously since the bank was established. (Cedar Falls Daily News, Waterloo Evening Courier, 26 April 1919). He held offices in the Republican party and was a member of the Methodist Episcopal church. Charles A. Rownd died in 1928 in Long Beach, California at age 84, leaving his widow Ella and two children, Edith Rownd Virden and Fred Rownd. At the time of his death, Charles owned 800 acres of land around Black Hawk County as well as other investments and interests. Edith Rownd Virden died seven months after her father, at a sanatorium in Los Angeles, California where she was being treated for tuberculosis. She left one daughter, Bernice Virden. Ella’s son Fred Rownd died in 1939 leaving a widow, Sena, but no children. 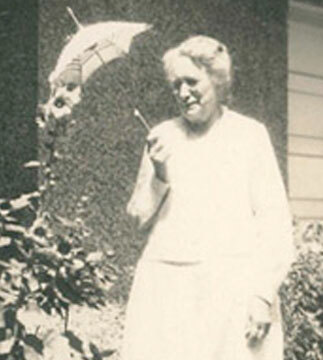 Ella Cotton Rownd subsequently made her home with her granddaughter Bernice Virden. After Ella’s death, Bernice moved to Florida, where she married Adolph Ringling in 1956. Bernice died childless in 1967. Throughout their married life, Ella and her husband demonstrated their commitment both to public service and philanthropic giving. For example, in 1925 Charles and Ella gave 40 acres of land to the Iowa State Teachers’ College to serve as a golf course and picnic grounds. After Charles’ death, Ella continued to support community organizations. She was a generous donor to the Methodist Episcopal Church, to which she gave $1,000 in 1928 to add to the books in the Rownd Memorial Library which had been established by her parents-in-law Samuel H. and Eliza Philpot Rownd. Ella’s estate planning was consistent with her commitment to public service and philanthropy. She left her estate to her granddaughter Bernice and daughter-in-law Sena, with provisions for the estate to benefit the community after their deaths. Sena also thoughtfully used the gifts she had received. In 1957 Sena Olson Rownd donated land on West 27th Street in Cedar Falls to the Cedar Falls Lutheran Home as a memorial to her husband Fred Rownd and their parents, Mr. and Mrs. Lars Olson and Mr. and Mrs. C. A. Rownd.